Memphis, Tennessee may be the home of rock and roll, but it also has its fair share of pest problems too. Not even Graceland is immune from the annoying animal and bug issues common to the area, a few of which we will take a look at in the following article. Tennessee is comprised mostly of farmland and wilderness, and the area surrounding Memphis is no exception to this. The city itself is moderately large, with the Greater Memphis area comprising a population of around 1.5 million residents. This includes a large suburban population of almost 1 million people, and a population of over 500,000 in the city itself. The suburban sprawl adjacent to more rural areas makes Memphis prone to a range of different pest control issues. 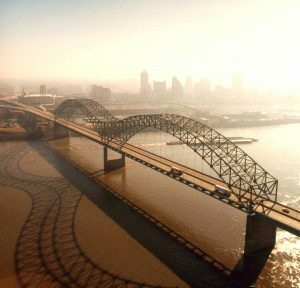 Memphis and the surrounding area has a ‘humid subtropical climate’, which sees the city experience four distinct seasons per year. It typically experiences hot and humid summers, with warm weather systems moving into Tennessee from Texas and the Gulf of Mexico. Daily evening thunderstorms are also common during the summer. Winters are normally mild, if a little chilly, meaning that bug activity can occur throughout the year. What’s more, storm activity can occur all throughout the year, especially during the spring months. This makes creepy crawlies and other pests more likely to seek refuge in warm, dry places (including your home) during this period. Aside from the common pest issues like cockroaches, termites and spiders, some of the more notable pest complaints in the Greater Memphis area include small pest animals. This is largely due to the proximity of Memphis’ suburbs to woodlands and rural areas. Squirrels and raccoons are both common pest complaints in the region and can create a range of problems for residents. These critters can nest in attics and wall spaces in an effort to escape the cold and wet, causing structural property damage, as well as causing a nuisance and racket in these areas. Raccoons especially are known for scavenging through garbage cans looking for food scraps, which can cause huge mess and is extremely unhygienic. Keeping these critters away from your home can be difficult, but is best addressed by boarding up spaces that the animals may be tempted to enter from the outside, and taking care that all refuse is sealed away from prying raccoon paws. To safely address pest animal infestations, removal is best carried out by a pest control specialist to avoid injury from scratches and bites. Pest removal experts also have the means and the expertise to safely capture small animals and release them out into the wild where they belong. They can also give you the best advice on how to ‘animal-proof’ your home to avoid further infestations. One of the leading pest control agencies servicing the Memphis area is All-State Pest Control, which has been in operation in the city since 1943. This company provides the full suite of pest control services, including typical bug and pest extermination, animal removal, as well as landscaping and garden care. All-State Pest Control also offers free phone based consultations for your pest control needs. Other reputable pest control businesses in the Memphis area include Memphis Pest Control Inc., Dart Pest Control and Kee Pest Control.